What is the past perfect simple? The past perfect simple is one of the English verb tenses. It describes actions or situations that happened/finished before another time in the past. It is commonly used with the past simple. I'd (already) cooked (1) when my wife arrived (2) back from work. I hadn't cooked (yet) (1) when my wife arrived (2) back from work. How do you write and pronounce the past perfect simple? 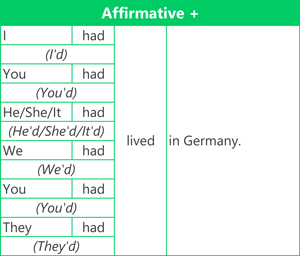 Use the auxiliary verb 'had' + main verb (Past participle). We commonly use contractions (e.g. 'I hadn't met friends' or 'He hadn't worked') for the past perfect simple tense, especially when speaking English. 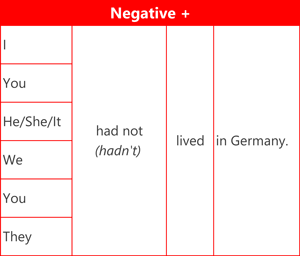 The past perfect simple with 'ed' has three different pronunciation sounds. [live] I'd lived in Germany. [save] I hadn't saved money for a new car. [stop] I'd stopped the car. [develop] They'd developed a new idea at the company. [travel] I'd travelled with friends. [panic] He'd panicked about the exam. [see] He'd seen this film. Time markers can be used with the past perfect simple and connect (or relate to) two different times in the past. I'd already worked at this company for two years (when I got promoted). This is used when something happened before (not later than) a specific time in the past. By 4 o'clock, he'd finished all his emails. By the time he left work, he'd finished all his emails. I'd already worked at this company for two years, when I got promoted. This shows that something finished a short time before a later action in the past. 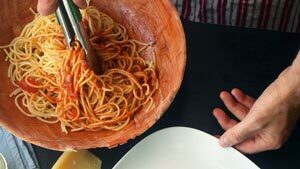 My wife arrived home at 6 0'clock, and I hadn't cooked dinner yet. These expressions can be used emphasis the sequence of events. It is not necessary to use the past perfect when the sequence of events is clear. The film had started before I ate dinner. = The film started before I ate dinner. The film started after I'd eaten dinner. = The film started after I ate dinner. What had happened before my wife came home from work yesterday? 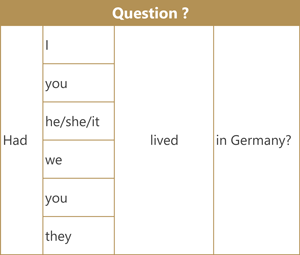 Type the verbs in the past perfect simple tense and use the affirmative, negative or question form. I (had gone, 'd gone)[go] to the supermarket. My brother (hadn't repaired, had not)[repair] the car yet. We ('d not, hadn't cleaned, had not)[clean] the house. (Had) you (spoken)[speak] to your parents-in-law? Yes, I (had). I ('d, had) already (bought)[buy] some flowers for my wife's birthday. She (hadn't replied, 'd not replied, had not replied)[reply] to my text message yet. (Had) the children (done)[do] their homework? No, they (had not, 'd not, hadn't). (Had) any of you (taken)[take] the dog for a walk? No, we (had not, 'd not, hadn't). We (hadn't made, 'd not made, had not made)[make] plans for the weekend. I ('d, had) already (put)[put] some wine in the fridge!